I have been working on this Spartan Aircraft Company trailer conversion for 16 months. I tend to do a lot of research on each step along the way. I like to follow manufacturer's instructions on their products. But sometimes all the instructions I find online just sound wrong. They don't apply to me. 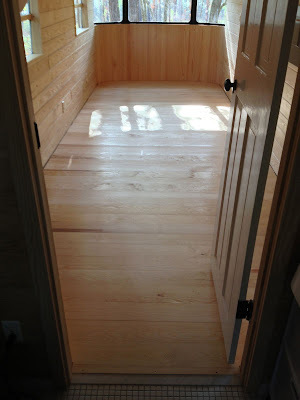 So here's how I did my plank floor. 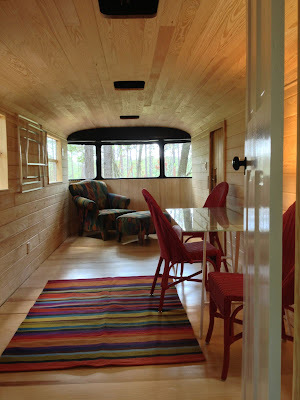 It's a very small space, about 20'x7', or 140 square feet. I'm not saying it's right, it's just right for me. I've included things that may seem dumb, like choosing which board goes where. But it was something I actually looked up and found nothing about it. So maybe other people are as weird as me and would like to hear how I decided. Next I got a mini-split air conditioner installed. 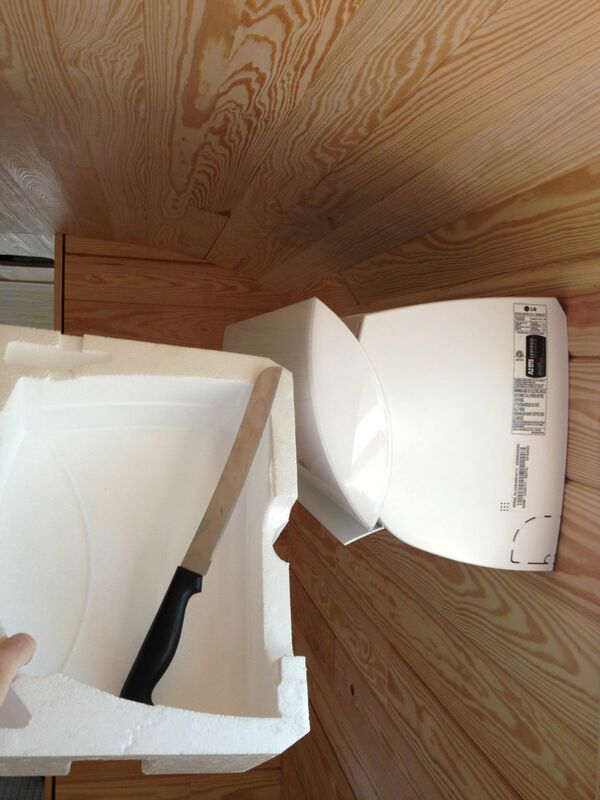 I saved the styrofoam packaging because I thought I could use it later. 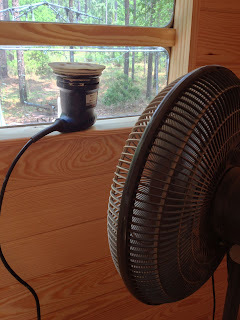 I ran the air conditioner for several weeks in the Artificial Intelligence mode where it cools, dehumidifies, or heats depending on conditions. 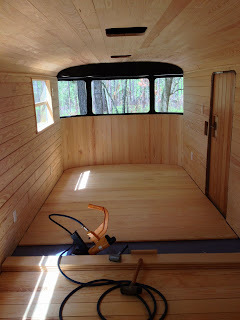 Ten days is probably enough to dry out the wood, but I had some issues come up with leaks in the front windows. I had to fix that before I could move on. I had a curve at one end of the space so I worked on those complicated pieces ahead of time. Vapor barrier: Yes or No? Most of my research said to use tar paper, rosin paper, or clear plastic sheeting (Visqueen) between the sub floor and the planks as a vapor barrier. I spent all this effort getting rid of the asphalt smell in this project from the sealant sprayed on the inside. I have no intention of adding anything back with a smell. Also I'm not certain a vapor barrier is a good idea here. Most of that advice I read is for people up North. It just doesn't apply to me in the Gulf Coastal Plain. 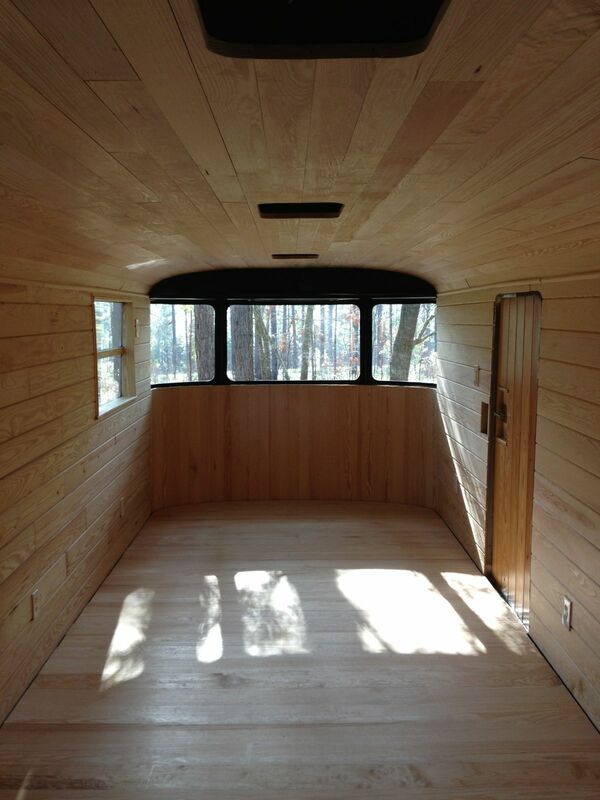 Before I put down the plywood subfloor I painted both sides. Paint can count as a vapor barrier. (I'm sensitive to the smell of plywood and I thought it would help.) I also have open cell foam sprayed on the underside, which is an air barrier but is vapor permeable. I am in a hot, humid climate and the building envelope will dry to the inside in the summer with the air conditioner on. If the inside is the cold, dry side and the outside is the hot, damp side, wouldn't I get condensation on the Visqueen that would wet the top of my subfloor? And then it would rot the wood and rust my steel frame? That sounds like a bad thing. Besides, any roll of something I bought would come in a quantity so large I would have way too much left over. I decided to just not add anything. I'm going with nothing but paint on my 3/4" BC plywood. I borrowed a floor stapler from my cousin and got started. I carried the lumber outside and set up to cut the other end. I am putting my boards across the short way because the primary steel frame underneath is two beams running front to back. I want the 3/4" planks to add structural stiffness to the floor. I selected boards to go in certain places in the space, cut them to the right length, and spread them out in place. There was a small variation in length in the area of the door. I accidentally moved that wall a little when I rebuilt the doorway. Except for where I messed it up, this aircraft manufactured frame is the most square and plumb thing I have ever worked on. 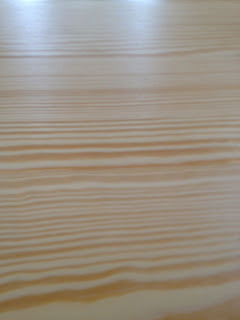 I had mostly very straight grained clear lumber with a variety of face grain and vertical grain. 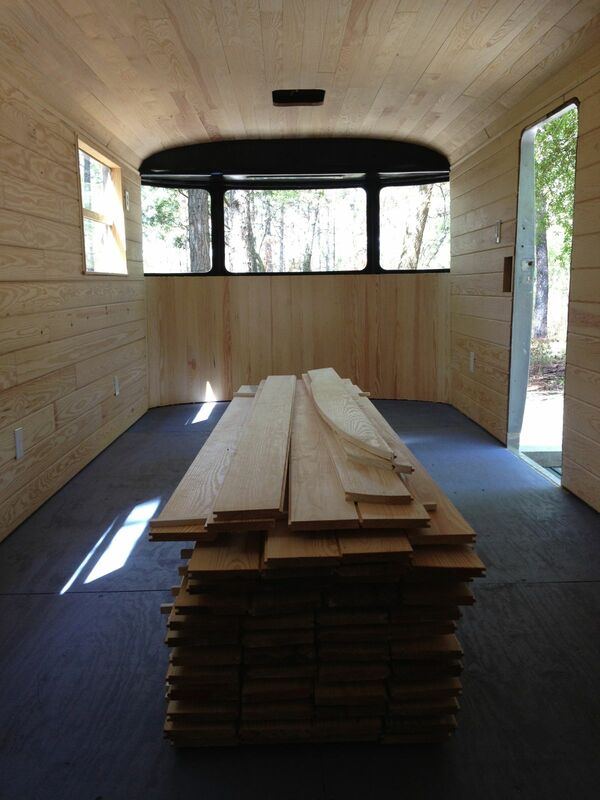 There were a few planks with a lot of heart wood at one end and about five pieces I'll call fancy grain. I deliberated if I should group those together or space them out. I decided to space out the fancy grain and try to get them in the light from the windows because they are really pretty. The pieces with a lot of heart I grouped together in the back behind the door where they'll probably end up covered up with work stuff like the sewing machine, soldering iron, mat cutter, etc. I know the heartwood is usually the most desirable but the clear yellow stuff looked nice uninterrupted. I had another piece that had heart on the other end and I almost put it right where I plan for the old refrigerator to go (converted into a cabinet.) Since the heart is darker I thought it would look like something gross leaking out from under the ice box, so I moved it. I am bad at nailing with a hammer, so instead of face nailing the first piece I drilled holes and used finish head sheetrock screws. Then I tested the air assisted stapler. It had a bad air leak. 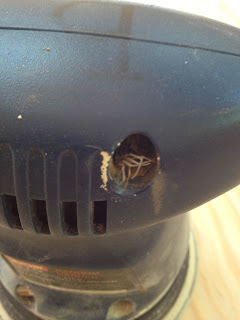 My air compressor couldn't keep up. I did more research and got up the nerve to take it apart. Once I figured out the rubber cap on top just had to be pried off I easily got to the three socket head screws underneath the top cap. They were loose. I took it apart some more and cleaned the o-ring and seal underneath and then screwed those three internal screws down tight. It worked great after that. Fastening the flooring was extremely hard on my back. I think I have a herniated disc. Just the same I was anxious to get done when it wasn't raining so I could avoid getting the saw out and putting it away multiple times. I'd already set up the air compressor in the laundry room. I did it all in two days. I tried to find recommendations for what air pressure to use for this Bostitch MIIIFS but found nothing except a range, 70 to 100 psi. I tried 70 psi and it didn't drive the staple in all the way. I cut it off with my Dremel tool and a cutting wheel. 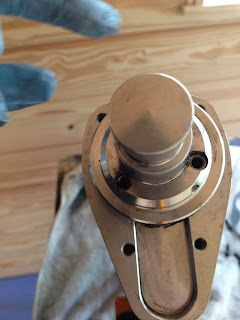 I turned my pressure regulator up to 80 psi and that seemed fine for this soft wood. I ran the pressure up to about 120 psi in my tank then I could do about 21 staples before I had to run the air compressor again. I have an auxiliary bottle on my air compressor rig, so your performance may vary. I used about six staples per plank. I moved the planks ahead of me enough to see the screws in the plywood going into the steel frame. That allowed me to avoid trying to drive any of these 15 gauge wire staples into steel. I did stupidly drive two of ten screws right into steel though. I just backed them out, decided I didn't need that one, and filled the holes with putty. 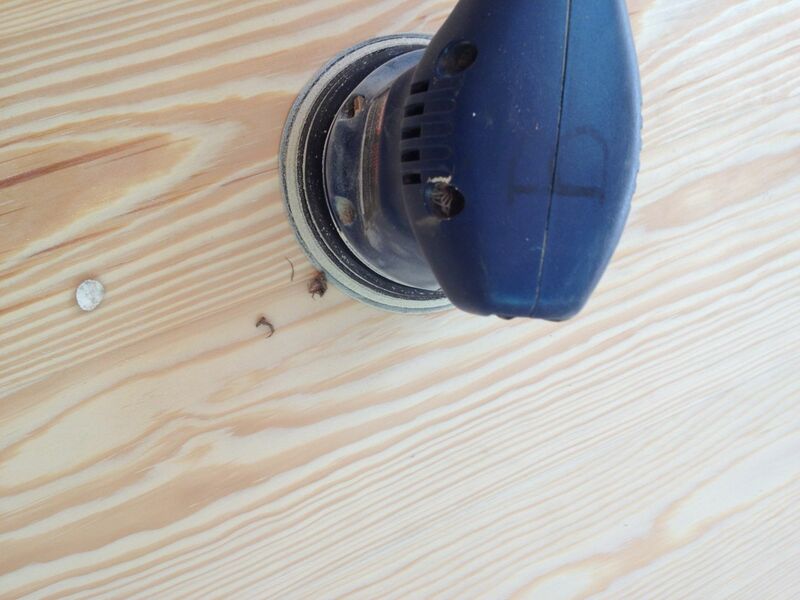 When I got to the end I had to cut one board with the jigsaw to fit. 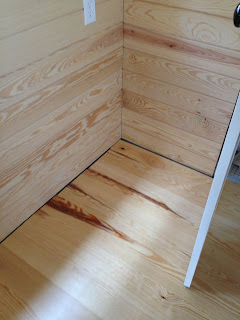 I left 1/2" gap between the floor and walls at both ends and 1/8" to 1/2" along the sides. (I was going for 1/4" but I changed my mind and moved some pieces that were cut the right length for a different spot.) I will cover the expansion gap with leftover flooring ripped in half on my dad's table saw with a radius routered into the top outside corner. It will be shorter and fatter than store-bought molding. But I won't need base shoe. Simple is better here. We did the door trim that way so it will all match. 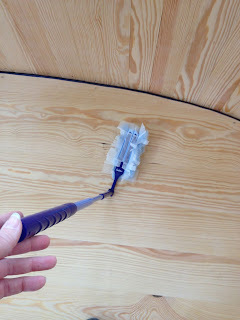 The trim on the front curved wall, which also leans out if you can't tell, is a subject for another blog. Working into a doorway was a huge help. which I caulked and screwed. My flooring was milled very well. It wasn't terrible uneven. And pine is soft wood. 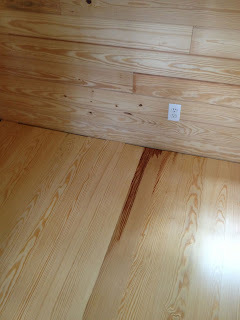 I really only needed to sand off any residual dirt from handling and to get rid of splinters between planks. I researched all the floor sanding stuff and decided none of it applied to me. All the stuff I read about the big orbital floor sanders is horror stories about swirl marks. And a belt sander is just total overkill. 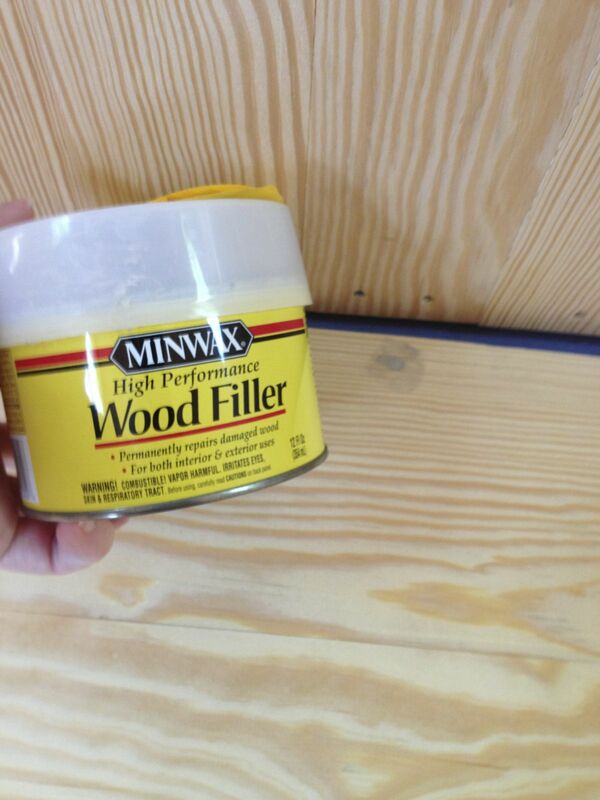 Why would I want to use a heavy grit on something that's already far smoother than that? The day after stapling I moved on to the sanding. 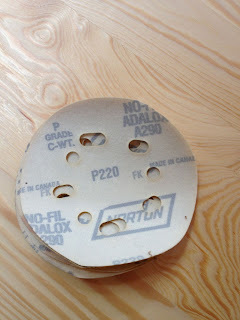 First I filled my screw holes with the very stinky Bondo type two-part putty. 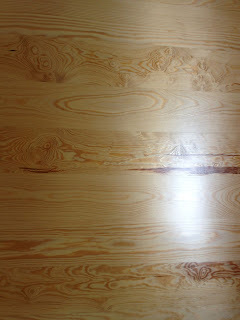 Pine will change color so dramatically no putty I put in there will match continuously over time. So I decided to just go for high performance instead of good looking. I didn't want to ruin my brand new air conditioner so I got out that styrofoam I saved. Cut the back off this. and something like a yardstick underneath to hold it in place. 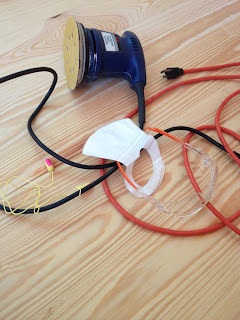 Then I assembled my safety gear. 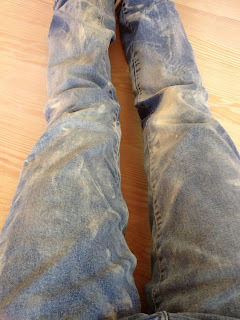 I got down on the floor and started sanding. 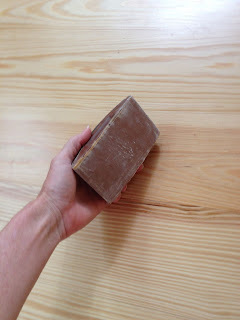 I had enough sand paper to use one sheet per five planks. It took about 20 minutes before the sander was too hot to hold onto it anymore. old dirt dauber nest in one of the screw holes of the sander. out of the screw holes with a bent staple. I was wearing gloves, so I didn't freak out. 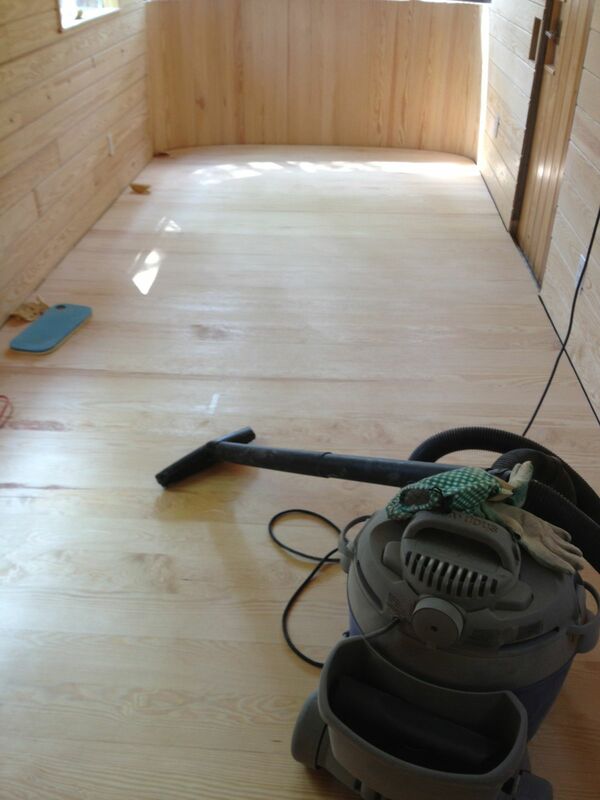 While the sander cooled off I vacuumed the floor and sat there reading Twitter on my phone. It was too much trouble to take off the ear plugs and dust mask and I was too filthy to go in my house. When I finished sanding I vacuumed everything thoroughly. I showered and put on clean jeans. I took the cover off the air conditioner and turned it on. Then I ran a duster over the floor. Dusting. I bang this thing on a tree outside to clean it and keep using it. 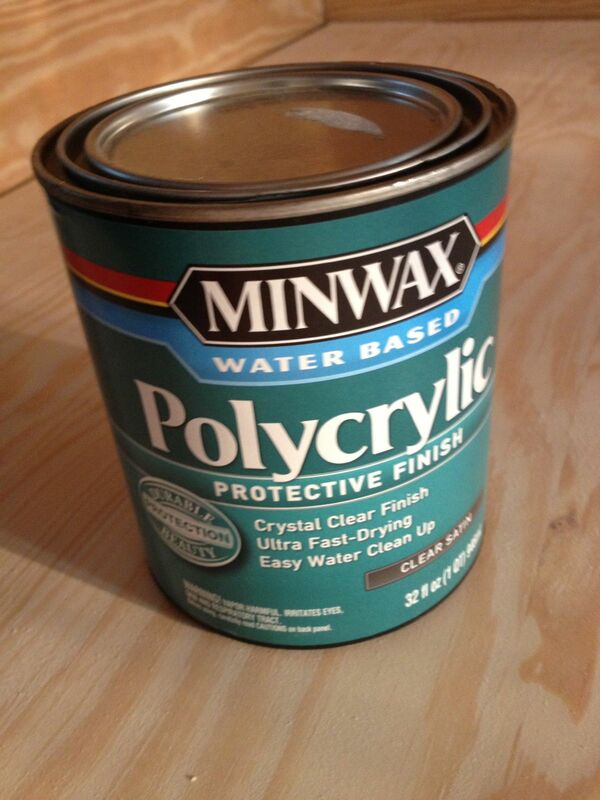 With a 3" Purdy nylon brush I put down a coat of Minwax Polycrylic. It is very thin. I just go real fast, one plank at a time back and forth with the container in the middle. It is so clear it's hard to see where it's going. I just go by feel. When the brush glides easily over the wood it's coated. If it grips, it's dry underneath. It dries so fast you can't go back over it without messing it up. You have to trust it to self-level. It's like nail polish that way. But contrary to what one guy I read on a forum thinks, it is NOT the same acrylic as nail enamel. That stuff is dissolved in toluene, not water. And because this is a water solvent it will raise the grain of the wood. Knowing this ahead of time let me not obsess too much about the sanding. I knew I was going to sand more. (Also knowing rugs and furniture would cover most of this up helped me move right along.) The first coat took about 40 ounces of finish. It really soaks in. Each subsequent coat takes less. The final coat only took about 20 ounces. The next day I sanded down the first coat of poly. 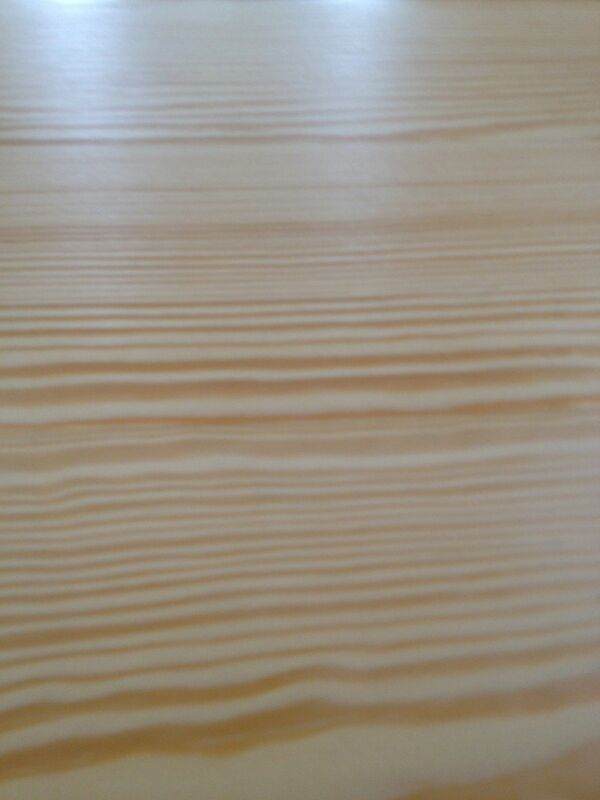 I sanded the first coat sort of a lot because of the raised grain. I had to stop three times for the sander to cool off. That's still a small fraction of how much I sanded the bare wood with the heavier paper though. I used up my three quarters of a quart of polycrylic nine planks short of the doorway and had to go to town for more. I finished the last nine planks when I got home then had to wait for the next day to sand and do more. (While I was in town I got a stainless steel threshold bent for the front door.) After the second coat I went so fast with the sander I never had to stop to cool down. I did the third coat and waited two hours. Then I went over it very lightly with 220 grit paper in a hand sanding block. 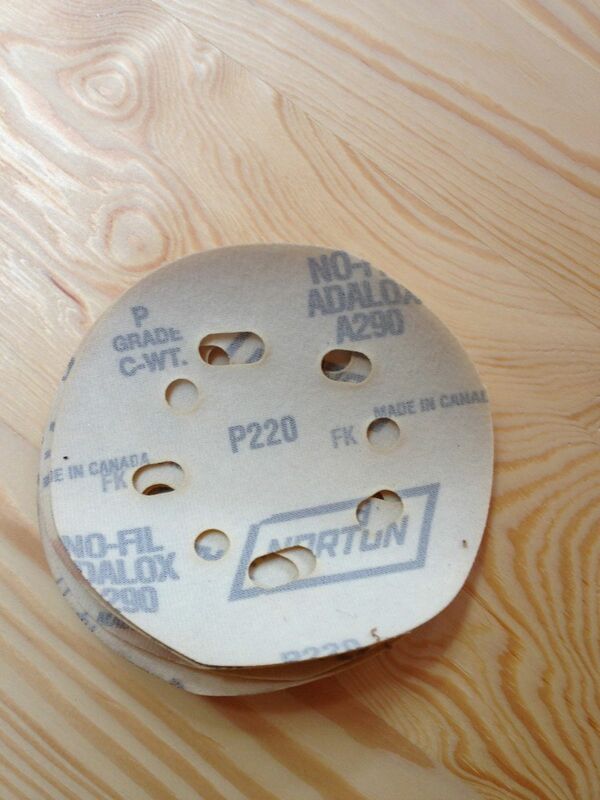 It doesn't make as much dust when it's fresh, but it can gum up the paper and make little balls of polysnot. I dusted it off with the Swiffer duster, banged it out outside, dusted again. Then I did a fourth coat. 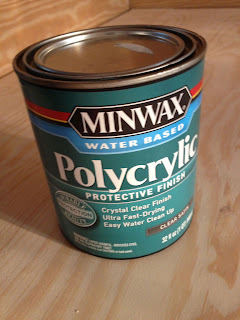 Minwax says three is recommended, but I sanded a lot between them. I felt better with four. Besides, I still had more than half a can of stuff left. Now I have about a quarter of a can. I should probably seal the door trim with it after I nail it up. I'm leaving the walls and ceiling unfinished. The humidity regulation is better that way. 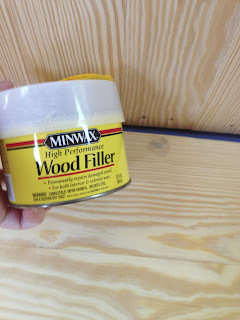 Minwax does not recommend this product for floors because it isn't as durable as what people expect and they don't want them bitching about it in a two years. But because my whole ROOM is pine it would look weird to have the floor a different tone. Oil finishes change the wood. This water based poly is the only stuff that basically just seals the wood without changing the contrast in the grain or imparting a yellower color. Because I'm just an individual, not a consortium of destructive hellions with clawed companions, I will use this on floors if I want to. I used it on the maple floor in my house and it's fine. It looks pretty bad under my stool on rollerblade casters, so I won't use any rolling chairs on this floor. Also my chemical sensitivities are too bad for oil based finishes. This stuff smells pretty bad and kind of gives me a headache, but the smell goes away in a day. I have been leaving the space closed up with the air conditioner running to dry it. 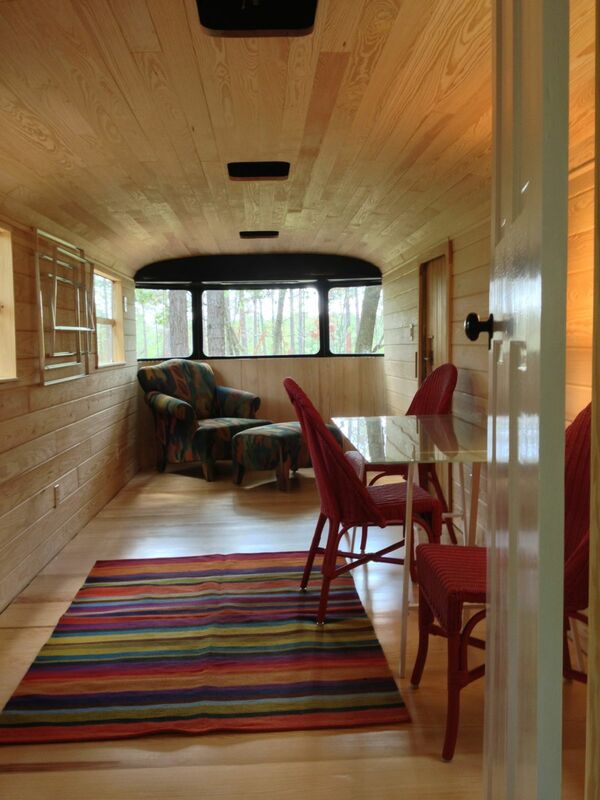 If I open the doors I'd have insects and pollen embedded in it and little lizard footprints across it. Also be warned that having it good and cold is important while brushing it on. It helps it keep a wet edge. If it is hot it dries way too fast. DO NOT STOP while you're brushing this stuff on. Don't take a phone call, don't read a text. The floor is doing it's job now. It stiffened the floor so it doesn't feel like a trampoline. 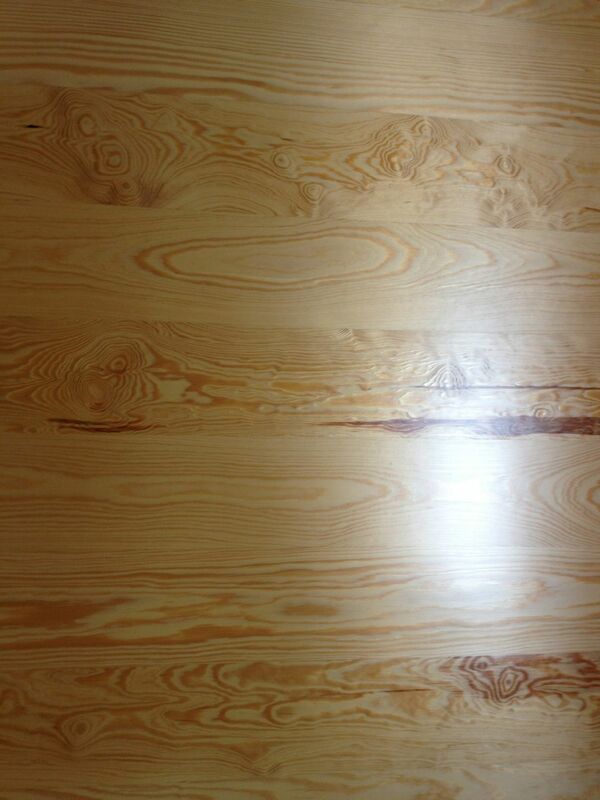 When I screwed down the last board and stood back to admire my work it was like being in a giant pine esophagus. I kept telling myself it wouldn't be like that once I filled it with stuff. I waited another day and then put furniture in my new space. I put felt feet on everything. I'll have to move it out of the way to put the base molding in but it's going to be a week before I get to make that. I wanted to finally use this space! I already decided my comfy chair is too big. I want that glass table to go there for photographing small items to sell on eBay. The Fireslate workbench goes where the table is. I'm going to have to sell the comfy chair. I want one of those fancy French zero gravity folding chairs now. Anybody want to trade? The project never ends around here. I can always think of something to design, to fix, to improve.